# 53 <Land> ColoRadio. What will we do? 1 $9M ColoRadio owns 22 Acres of Agriculture Land. 2 $3M Our Farmers play Boardgames, not like Caverna, nor Settlers of Catan. 3 $9M Exports: Amateur Radio Sets. We outsell China. 4 $7M All of our Hams can be heard on the Ham Amateur Radio Waves around the real World. 5 $2M Our Hams can also be eaten. We also raise Pigs. Dental Treatments. Dental Humor. Dental Ringtones. Dental Songs. Dentistry: Dr Lauren remains Head Dentist. Nurse Ginger Vitis left us on a Quest with Lisa Newcar. Good Ol' Doc was sequestered in the Dental Operatories with Nurse Kandi. Receptionist Pam Perfect will take your calls & emails. Music. Ringtones. Songs. Lyrics. Music Lessons. Computer Programming. Kern Culinary College is cool! Dentist's Cookbook. Doctor's Cookbook. Recipes for Malpractice. Kern Culinary College Degrees: °K = Kernel Core Courses. °C = College Courses. °U = Undergraduate Classes. °F = Fellowship Classes. "It all started from a Seed of an Idea, & sprouted from there." 2 Tin Cans attached by a long String -> Crystal Radio Set -> Shortwave Radio -> Amateur "Ham" Radio -> Burner Smartphones. Blogs. Social Media. Text Messages. eMails. "Free Stuff"
We wanted Free College Education for all; but the Adults always say no. Probability & Statistical Analyses -> Beat the Systems. Land is Power. Land is Forever. Land is Life. Land. Parcels of Land. Property. Trust Deeds. Warrant Deeds. Real Estate. From Size 61 Pants to Size 34 Pants. "Taking Control of Food, before food takes control of you." Molossian Navy& the Misfit Regatta. Ministry of Propaganda. Radio Molossia. Tourism. Mustang News. Host of MicroCon 2015 @ Anaheim, CA 04/2015. Italian Heritage. Emperor Norton I inspiration. Grand Republic of Vuldstein. Population = 29 & growing. Republic of Molossia is a satirical micronation project that has a history extending over several decades. 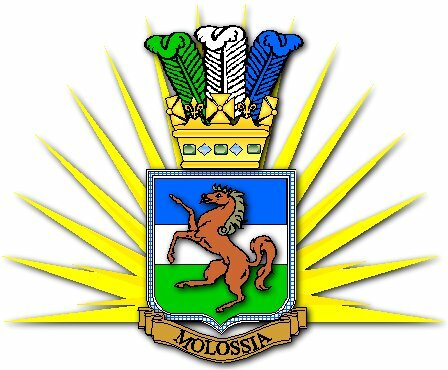 It was founded on 26 May, 1977 by well-known MicroNational hobbyist Kevin Baugh, and inspired by the kingdom of Molossia, which was part of the League of Epirus in Greece, until its conquest by Rome. However, the modern incarnation more closely approximates a stereotypical South American banana republic than its ancient namesake. Molossia consists of Baugh's small rural acreage in Dayton, Nevada, and its citizens are limited to the members of his family who reside there. The Molossian defence forces consist of Baugh's son and an inflatable rubber dinghy. Transportation services consist of a model railway which traverses parts of the property. The property is also home to a number of art installations, including the Tower of the Winds, a Peace Pole and Norton Park. The Molossian tricolour is raised before the Presidential residence each morning with due solemnity; it remains one of the few MicroNational flags that has actually been raised on a real flagpole. Molossia's first three coins were manufactured by President Baugh by affixing coloured labels to plastic gambling chips - an appropriate symbol of the Micronation's Nevada heritage. It's first metal coin was produced by USNS member Jorge Vidal, and commemorates a treaty of friendship between Molossia and the Grand Duchy of Westarctica. The Grand Duchy of Westarctica is a micronation created by AmericanTravis McHenry, which claims Marie Byrd Land. Westarctica was founded on a supposed loophole in the Antarctic Treaty. The claim of micronation status has been used as a basis to mint and sell coins to collectors. Westarctica is not recognised by the government of any country, despite its attempts. The bulk of the Micronation's claimed territory consists of Marie Byrd Land, defined as all land south of 60° S and between 90° W and 150° W. This is between the claim of Chile and the claim of New Zealand. The original capital was named Achilles. Later on, the Balleny Islands claimed by New Zealand and Peter I Island claimed by Norway were annexed. Peter I Island was declared the new capital of Westarctica. Nonprofit Public Benefit Corporation. Population = 389. 2005 Treaty of Friendship between Westarctica and Molossia. Three Levels of Support Westarctica, Inc. is a tax exempt nonprofit public benefit corporation registered in the state of California. Donations to Westarctica, Inc. are not tax deductible. Noble of Westarctica Since 2001, Westarctica has had a proud tradition of recognizing our most generous patrons with honorary "titles" of nobility. Duke, Count, or Baron all of our Hereditary Nobles are valued sponsors of Westarctica's mission to preserve the ecology of Western Antarctica. We're not pretending these "titles" will get you into Buckingham Palace to have lunch with the Queen, but it gives you a talking point to help spread the word about Westarctica's goals and the critical condition of "your noble land" on the West Antarctic Ice Sheet. Knight of Westarctica The Knights of the Snowflake are some of our strongest and most active supporters. Membership in the Order of the Snowflake is not currently available for purchase, but must be earned through service to Westarctica or bestowed as a token of gratitude from the Grand Duke. There are three classes of the Order: Knight, Knight Commander, and Grand Knight Commander. All classes have a unique medal that is bestowed along with a certificate. Citizen of Westarctica Citizenship in Westarctica is the most basic and "duty free" way of supporting our cause. There is no required financial obligation, but we will include all citizens in our quarterly newsletter and our mailing list. Our roster of citizens is also where we look when we need volunteers for our upcoming projects. In the past, many supporters who started out as citizens were able to rise up the ranks and become influential officers of our government through active volunteering. Citizens have no voting rights in our government, but are still considered valued patrons of our fledgling nation! Gift Shop. Metal & Wooden Coins. Commemorative Medals. Maps. Westarctica is releasing three different Stamp Designs in 2016. The Rise, Fall, and Rebirth of Westarctica charts the struggles of Grand Duke Travis as he vainly seeks recognition from unsympathetic foreign governments and battles the internal squabbles of his citizens. This is the incredible true story of one man’s attempt to create an independent country on the continent of Antarctica. Westarctica holds non-consultative status with the United Nations Department of Economic and Social Affairs - NGO Branch. Westarctica was founded in 2001, and dedicated itself to building and occupying a research station on the continent of Antarctica. Westarctica is the ONLY nonprofit organization in the world dedicated entirely to Western Antarctica. Western Antarctica is one of the most fragile ecosystems on the planet, yet there is no single organization dedicated to studying and preserving this vast, magnificent, desolate region. It falls under the political dominion of no government, thus Western Antarctica has no voice in the international community. Westarctica seeks to change that by acting as Western Antarctica's advocate to the world. In line with our mission, we have established ourselves as an independent nation with self-granted sovereignty, free from restrictions or obligations imposed by other countries.